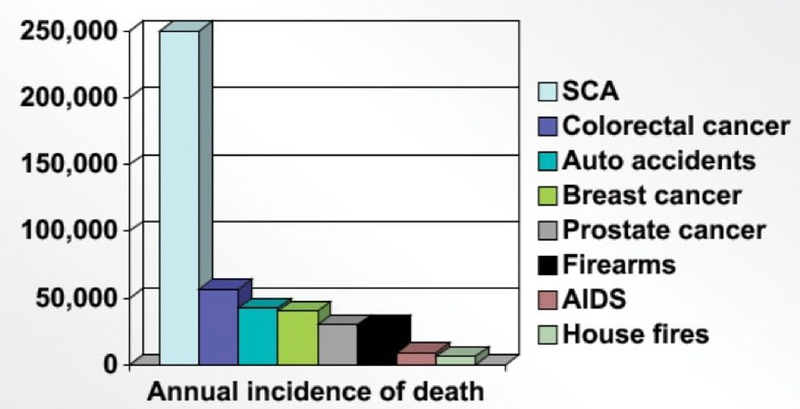 Nearly 425,000 out-of-hospital sudden cardiac arrests occur annually in the United States (1). Almost every 90 seconds a sudden cardiac arrest occurs (1). About 88% of those cardiac arrests occur in the home (1). Close to 10,000 cardiac arrests occur in the workplace (3). Less than 8% of people who suffer an out-of-hospital cardiac arrest survive (2). Less than one-third (1/3) of out-of-hospital sudden cardiac arrests victims receive bystander CPR (2). Sudden cardiac arrest is by far the leading cause of death in adults over 40 years of age (4). 1 in every 5 individuals know the signs and symptoms of a Heart Attack (5). 1 in every 350 individuals know how to perform CPR correctly (5). Data indicates that 40% survive sudden cardiac arrest when high-quality CPR is perform within 6 mins.